We opened the 2014 college football season by presenting our preseason Triangle All-Stars, a group so weird and wonderful that most of them played or coached their way out of contention for our postseason list. Triangle All-Stars burn bright, and they burn fast. Greatness this Triangle-y isn’t always meant to last long. In fact, only one player returns now after also enjoying his August day in the sun (hint: ¯\_(ツ)_/¯ ). So treasure this fresh look at the people who made college football special to us this year. They may not be the best (though some of them are). They may not have the shiniest stats (though some of them do). But they made us glad to be fans this season, and that’s worth celebrating. Holly Anderson: The draw of the Bears as a football team is easy to divine. They may not play everyone’s preferred brand of ball, but you don’t have to claim personal ties to Baylor, or Waco, or even college football to appreciate a squad scoring close to 50 points a game with this kind of grace and speed. There’s a broad appeal. Their skipper, though. He’s so specific. 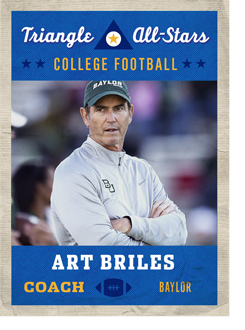 There are interchangeable coaches, but Art Briles is not one of them. He’s plainspoken, but there’s poetry to it. His accent is inimitable for non-Texans. If you latched on to the trend of dressing your baby up like a Big 12 head coach for Halloween, what would you even put on this one? How, apart from a tiny Bears hat, could you even tell it was wearing a Briles costume? How young a human being can be taught a serene thousand-yard stare and effortless shade-casting? Briles: "I guess they went $59.95 for the Big 12 helmet up here. They need to shine it up a little bit." Whoever among you manages to make your child’s first words “slogan around,” be sure and let us know. Matt Borcas: The BCS era was defined by the incomprehensibility of the formula that determined the rankings. Outrage ensued, and a playoff was born. A committee of humans, it was thought, could see beyond the numbers, and thus better govern college football’s ever-changing hierarchy. Their process would be knowable, and they would be able to factor in the all-important “eye test” when needed, leading to a fairer and less inherently controversial system. Utopia, it seemed, was possible in college football. As you might have guessed, it was incredibly difficult to type the previous paragraph with a straight face. And thank god! As others have argued before, ambiguity and chaos underlie college football’s distinctive charm, and as we found out this season, a playoff selection committee only enhances those traits. I mean, think about how ridiculous it is that a 12-member panel with dubious qualifications (and obvious biases) met weekly in Dallas to rank college football teams, and then released said rankings in the most dramatic fashion imaginable: on a Tuesday-night television special reminiscent of the American Idol results show. Could you imagine this happening in any other sport? 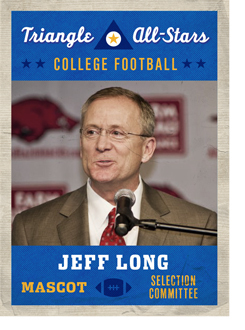 So, thank you, Jeff Long, chairman of the College Football Playoff selection committee, for proving definitively that humans can be more abstruse than computers — would the BCS have ever dropped TCU three spots after a 52-point win, or ranked undefeated Florida State behind two one-loss teams? — and in doing so showing that the sport’s future is very, very bright. Long is a worthy mascot for the Triangle All-Stars, and for a nominal fee is available for birthday parties and other such events. But here is what fundamentally separates college football from the NFL: In the pros, Romo’s boom-or-bust volatility is scorned as … well, as unprofessional, and dissected with the stern rigidity of a bad performance review. In college, that shaggy-dog quality is precisely what we loved most about Wallace, a rough-around-the-edges project whose obvious flaws only made his frequent bouts of brilliance even more entertaining (and vice versa). The senior was never going to impress anyone as the best quarterback from an objective, technical point of view, but he was liable to beat the guy who carried that distinction on any given Saturday. He was also liable to flame out spectacularly. Either way, it was always worth the price of admission. 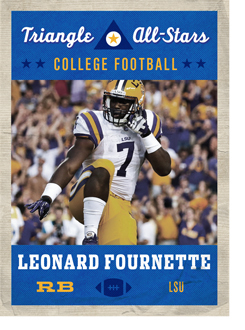 And how much better does the name Leonard make the Leonard Fournette experience? 200 percent? 400 percent? We need more superstars named Leonard. If helpless Aggies defensive backs have to be sacrificed for the cause, it’s worth it. Todd Gurley was my preseason pick for this team, but he had a season from hell, and now he’s off to the NFL. It’s sad, and Gurley should’ve been here, but that’s a longer conversation. For now: If there’s one player who can channel Gurley’s spirit, it’s Fournette. Hinton: Tyler Lockett has all of the numbers and records and whatnot — he just passed his father, Kevin, as the most prolific receiver in K-State history and has made myriad contributions as an All-American return man — but an underrated aspect of his appeal is how much he looks like a kid on the field. Not in the Favreian, “He’s just having fun out there” sense, but literally: At 5-foot-11, 175 pounds, Lockett kind of looks like a boy among men. He’s largely devoid of the musclebound density of other short-stuff heroes like, say, former Wildcats star Darren Sproles, and he’s a far cry from the towering, pterodactyl-like targets currently favored at the next level. 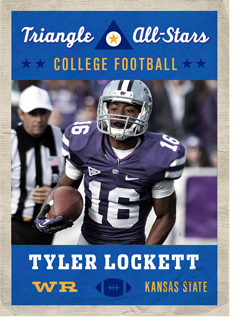 Instead, Lockett has survived and thrived on an old-school combination of athleticism and technique, consistently creating separation with the best hitch-and-go move in the college game. (He can also go up and get it in traffic if necessary.) He’s like the scrawny new kid who gets picked last at recess on the first day of school, then gets picked first every day for the rest of the year. Presumably his NFL career will unfold along the same lines. Sharp: Tight ends have become bigger, more explosive weapons in recent years, blurring position boundaries and terrorizing offenses. That’s fine. But when I think of the greatest tight ends from my childhood, the best compliment I can give them is that they were annoying. Guys like Shannon Sharpe and Todd Heap both had this quality. Jay Novacek and Mark Chmura too. Tony Gonzalez had it in Kansas City and especially in Atlanta, and Jason Witten might be the best example of all time. All the greatest tight ends will annoy the crap out of you. Watching a great tight end is an endless exercise in “How is he outrunning the safeties?” and “How did he get lost there?” and “Come on, HOW IS HE OPEN AGAIN?” That’s Nick O’Leary. As a bonus, O’Leary also brings an added “Will that guy ever graduate?? ?” twist to his application to the hall of history’s most obnoxious offensive weapons. At one point he was best known for being Jack Nickalus’s grandson, and later he became even better known for surviving this horrific motor cycle crash, but now I’m pretty sure he just annoys the crap out of college football fans every week. That’s the gold standard. He’s been Jameis Winston’s security blanket the past two years, and after finishing as a John Mackey Award finalist last season, he won it this year. 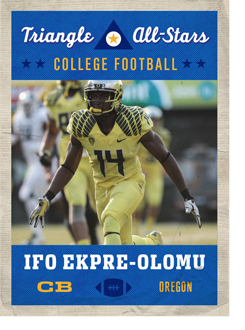 Soon he’ll be doing this in the NFL, but for now we’ll wait to watch him do it to Oregon in the Rose Bowl. He’s so obnoxiously consistent that you can’t help but love him. Also, he’s the only player on this list to suplex someone on the field. 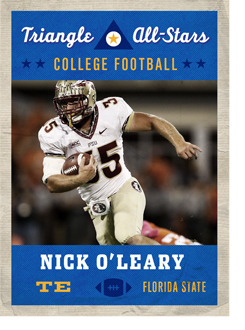 Nick O’Leary is cool with me. Mallory Rubin: Usually, selecting the offensive linemen is the toughest part of any college football all-star team process, Triangle or otherwise. Not this time, though. This time, identifying our man was as easy as shouting “Woo Pig Sooie!” or getting lost in a Bret Bielema Google Images search. 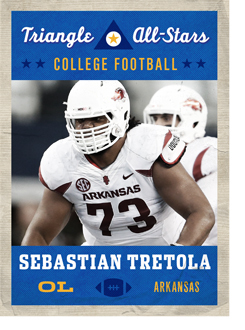 For starters, Sebastian Tretola was actually good at his job. The juco transfer spent time at both guard and tackle, earning All-SEC honors from ESPN thanks to his versatility and effectiveness. But, infinitely more importantly, the 6-5, 350-pounder transcended his position to deliver one of the plays of the season, throwing a touchdown pass to Arkansas’s long-snapper on a fourth-down trick play against UAB. Because Tretola and the Razorbacks are totally awesome, they launched a fake Heisman campaign shortly thereafter. Holy hell. Nation, Marcus Mariota is great and all, but should we consider pushing for a revote? Borcas: There isn’t any question that ¯\_(ツ)_/¯ was the emoticon of the year. It was used to convey a wide range of feelings throughout 2014: incredulity, indifference, exasperation; the list goes on. For Big Ten quarterbacks, though, ¯\_(ツ)_/¯ represented something entirely different: the crushing pain of a Joey Bosa sack. Over the course of the season, Bosa’s trademark shrug became a meme unto itself, in part because it was deployed so frequently — Bosa tallied 13.5 sacks on the season, good for fourth in the FBS — but mainly because it was so damn fitting. The blasé, I-could-do-this-in-my-sleep celebration was a perfect distillation of the seeming effortlessness with which he performed, and figures to become even more pronounced as his career progresses. After all, once you’ve achieved a certain level of success, what else is there to do but shrug? 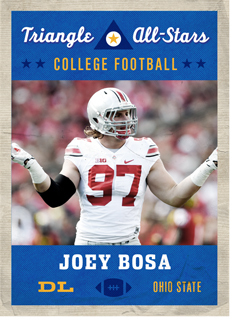 As you’ve surely pieced together by now, Bosa is the only two-time member of the college football Triangle All-Stars. His shrug has inspired pumpkins and toddlers alike, and is one of the few sack dances that doesn’t attract an onslaught of excessive-celebration penalty flags. It has effectively replaced the backflip as Bosa’s preferred bodily motion, which undoubtedly makes his father happy. Hinton: It’s always interesting to watch an abrupt consensus form around overlooked, undervalued guys like Scooby Wright III, who was elevated virtually overnight from relative obscurity2 to the most decorated defensive player in college football. And voilà: Just like that, a guy with essentially no national profile a few weeks before finds himself flush with hardware in December, including, in Wright’s case, the Bednarik, Nagurski, and Lombardi awards as the best defensive player in the nation and a top-10 finish in the Heisman race.3 But whether or not anyone outside of the state of Arizona had ever caught on, Wright’s productivity would stand as a shrine unto itself. Anderson: I cover a very specific window of a player’s career, and because I’m biased, I think it’s the best window: From the time they set foot on the field in late August of their first year until they exit the field in December or January of their last year, they’re mine. I don’t do much recruiting, which is fine because overall I find it sort of creepy, and I don’t do much with the draft, which is fine because the NFL’s a different sport. By the time a player hits the combine, he’s out of my purview. So, from a purely selfish standpoint — no matter what it means for that particular athlete’s career and no matter how ardently I believe players ought to get paid just as soon as it’s the smart thing for them to do — I’m always happy to see them come back for their senior year. But you know what? That’s part of his charm. Part of his Tri-Starness. Collins chose his own path even though he knew it would mean disappointing people he respects and loves, and not everyone has that kind of courage or independent spirit. 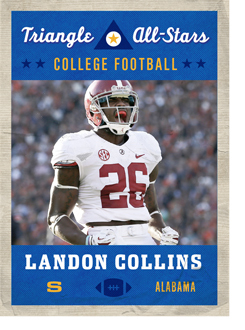 Certainly, not everyone plays a brand of safety as utterly dominating as Collins’s, an All-SEC-, All-America-worthy style that made him arguably the most important player on Alabama’s top-five defense this season. He registered 51 tackles, including 3.5 for a loss, while picking off three passes and breaking up six, and he’ll probably give Ohio State QB Cardale Jones hell in the Sugar Bowl. Anderson: Josh Lambert’s field goal percentage put him right around the median this season. He made 27 of 36 attempts, a 75 percent success rate that was good for fifth in the Big 12 and 54th nationally. Those 36 attempts, however, were six more than the next most prolific kicker tried, and Lambert’s 27 makes led the FBS as well. He also made four of five field goal attempts from at least 50 yards. He’s a sophomore, so if you’re into keeping an eye on kickers, here’s one! What did Holgorsen say to Lambert before game-winning kick? 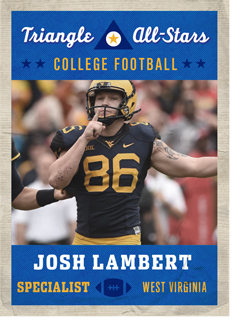 "I haven't talked to Josh Lambert since he got on campus." See you next year, cherub. 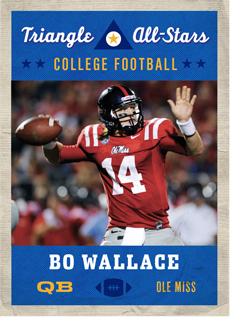 When I went to Oxford myself for the annual Egg Bowl showdown with Mississippi State, Wallace was simultaneously erratic (13-of-30 passing, one interception) and prolific (296 yards, good for an average of 22.8 yards per completion) in an Ole Miss win, a tidy distillation of his career at large. In the 2013 Egg Bowl, the Rebels lost when Wallace fumbled on his way to a tying touchdown in overtime. 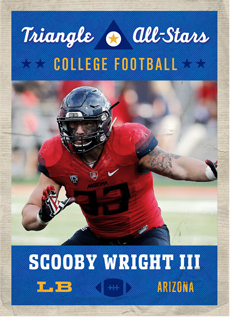 Pac-12 fans may have been hip to Scooby after his freshman All-America campaign in 2013, but that didn’t generate much traction nationally. Notably, Wright wasn’t even a finalist for the Butkus Award, given to the nation’s top linebacker, because he wasn’t on the preseason watch list.